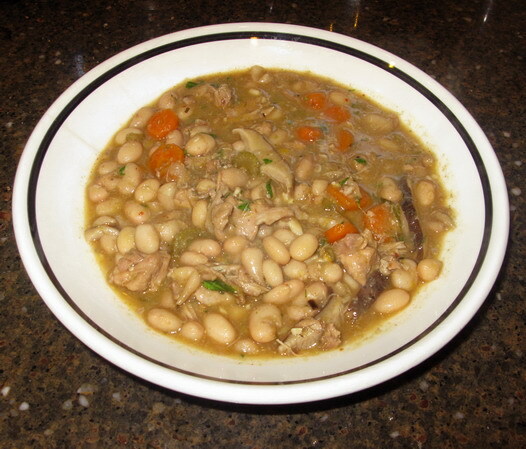 Every ingredient to this particular dish was local: the beans, the onions, garlic, carrots, celery, leeks, mushrooms, rosemary, thyme, sage and oh, yeah, the rabbit. Oh, wait a minute: the white wine isn’t from Athens, but it is from Ohio, and the salt–well, it is from the ocean, which is not local to Ohio. At least, not yet. Maybe after the polar ice caps melt. Then we Ohioans might have some ocean-front property, but I doubt it even then. Oceans have been thin on the ground here for a long while–at least since the Devonian Period, if I am remembering my geology correctly. So, no local sea salt for little old me. Back to the dish at hand. 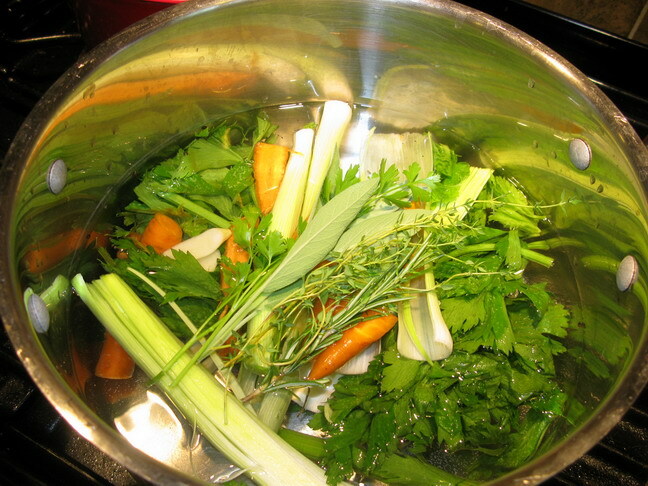 It all starts with the making of rabbit stock. And lots of pure, cold water. Always start your stocks with cold water–it helps dissolve the gelatin in the bones which makes for a thicker, richer stock that when chilled, will turn into a gel. Melted, a gelled stock has a velvety feel on the tongue that is qualitatively different than the watery feel of canned broths. You just have to feel and taste it for yourself–it is hard to describe the difference. On to rabbit stock–it is just as easy as making any other stock. I used bones from two rabbits which had most of the meat cut from them to make rabbit stew meat, but one could use full carcasses for this just as easily. Or do like I do with chicken stock and use a whole carcass and then a bunch of bones. Just remember, the more bones you have, the richer your stock will be. Basically, follow my instructions on how to make chicken stock for making rabbit stock, while noting the differences I mention here. The biggest difference is that I put garlic in my rabbit stock, when I do not use it in my chicken stock. Why is that? Because I think that garlic really compliments the meat of domestic rabbit perfectly, and one little clove of garlic never ruined anything. Well, maybe it might have ruined a batch of beer or a bowl of cereal, but that is probably about it. I might not chuck that garlic clove into the pot if I was going to use the rabbit stock for some delicate soup or whatnot, but since this was going to be the base of a really hearty and garlicky stew, I didn’t see why I should leave out the garlic. The second difference is that I leave out onions and just use leeks in my rabbit stock. Why is that? Well, I guess it is because I like the leek flavor better in the rabbit stock. You can use onion if you want–I won’t fuss at you about it. The third difference is my secret ingredient–that single solitary dried shiitake mushroom. To add a layer of depth to the stock–an extra umami kick, if you will. Besides, you will find that rabbit meat and mushrooms are a classic combination if you peruse European cookbooks for recipes involving leporids and fungi. Those are the largest differences in the ingredients and making of rabbit stock. I also tend not to simmer the stock as long as I do chicken stock–the bones of domestic rabbits are smaller and more delicate than those of chickens and they seem to give up their goodness much more easily. 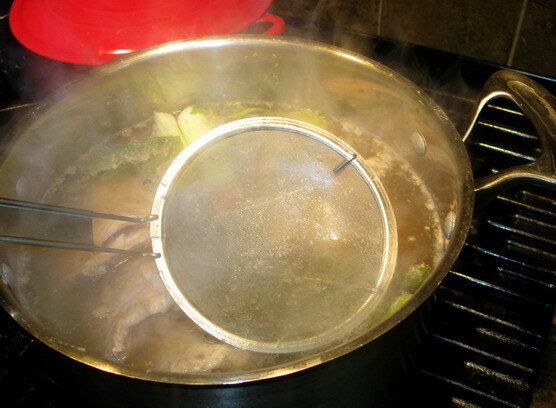 I tend to simmer my rabbit stock for only about four to six hours as opposed to the marathon six to twelve hours for chicken stock. Rinse off your carcasses and bones, then put them in a pot with your herbs and vegetables. Add cold water to cover the ingredients by at least three inches or so. Cold water. Starting with hot water will not speed the process up and you will end up with a cloudy stock that doesn’t have as much dissolved gelatin from the bones in it. So just put the cold water in the pot in the first place and take the time to let it come to a simmer naturally. Skim the scum that comes to the top during the first part of the cooking. And instead of using a spoon like you see in the photos of the chicken stock post–the link is above so you cannot miss it–use one of these neato keen super fine meshed skimmer thingies you can find at most Asian grocery stores. Just slip that bad boy under the scum, lift and voila–the skank is gone! Rinse it under running water and go skank skimming again. It is so much easier than the spoon method and it is fun, too. And you end up with clearer stock when you are done! And–when your stock is done, strain out all the solid bits. If you used a whole carcass, the meat has probably fallen off the bones, but if not, pull off what is left on the bones and set it aside. Discard the bones and the vegetables, but keep the meat. If you are not going to use the stock immediately, cool it quickly and thoroughly and put it into containers in your fridge or your freezer depending on when you foresee using it. It can keep about a week in the fridge, for months in the freezer, just like chicken stock. Now, if you are going to use the stock immediately to make the stew that this post is actually about, then leave it in the pot and go on with your recipe. Now, while that stock is simmering, you can do all the stuff you need to do to get the rest of the ingredients ready. You can thaw out any of your boneless rabbit stew meat you might have to use in the stew, shell the beans and cut up the carrots, celery, leeks, onions, garlic, mushrooms and herbs. 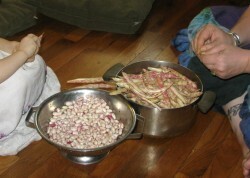 Shelling horticultural beans goes faster if you have help, but I find it quite relaxing even if I am by myself. Besides, what’s the hurry? You have to simmer the stock for at least four hours, so why rush on everything else? This is not a quick recipe–but that is okay. Sometimes some of us like slow food, food that takes a long, leisurely route from the kitchen to the table. Once you have the preparations done–the stock made and any meat from the bones set aside, the beans shelled, the vegetables sliced and the boneless rabbit stew meat–it all comes together quickly enough, and then just goes on the back of the stove to simmer pretty well on its own. Just like stock–this stew doesn’t need your undivided attention–just make sure it is simmering and not boiling, and nothing is sticking to the bottom, and you are golden–no worries. So yeah, this all-local recipe is slow-going–I did make it on a lazy Sunday after all, with lots of help from a nearly-three-year-old who had great fun assisting me–but it is all good. Not only is it easy to put together, it is fun, and the resulting flavor makes everything worthwhile. It is by turns rich and complex in flavor, and yet simple and pure. I don’t know how else to describe it. Rabbit has such a clear, pure flavor, and the beans are earthy, and that darkness is accented by the deep flavor of the shiitake. But then the vegetables–the carrots, celery and caramelized onions–add delicious sweetness to the mixture while the sharp scents of the herbs float over everything. Heat the oil or drippings in the bottom of a large, heavy-bottomed pot on medium high heat. Add the onions and sprinkle with a teaspoon of salt and cook, stirring, until the onions turn golden. 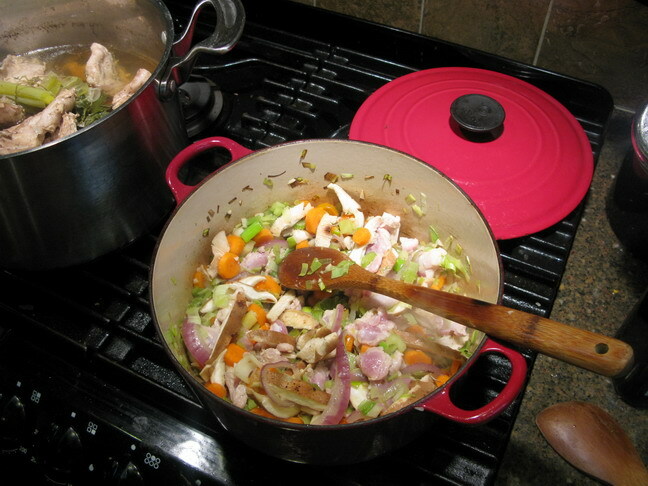 Add the leeks, garlic, celery, carrots and mushrooms, and cook, stirring until the onions are a deep golden brown and the other vegetables have been tinged with brown and everything is smelling wonderful. Add the boneless rabbit meat, and cook, stirring, until it browns lightly. Sprinkle in the first measures of fresh herbs and the Spanish paprika. Pour in the wine and deglaze the bottom of the pot, then allow the alcohol to simmer out of the wine. 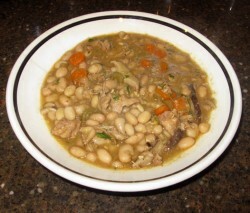 Add the rabbit stock or whatever other liquid you are using, and stir in the beans. Add the meat from the rabbit stock, if you had any. Throw in the bay leaf. Bring to a brisk simmer, then turn down the heat to a gentle simmer, cover the pot and cook until the beans and rabbit are both tender. If the stew liquid isn’t thick enough to your taste, take out about a half cup of beans and mash them thoroughly. Stir them back into the stew and voila–instant thickener! No extra added fat or starch. Beans are like magic that way. Season to taste with salt and pepper, and garnish with the fresh herbs just before serving. That sounds delicious! I am going to have to find myself a local rabbit. I ate rabbit frequently while living in Portugal but have mostly forgotten about it here in the US. Thanks for reminding me.